Summer camps are part of the experience of youth culture in America. There are camps for tennis, for computer skills, for learning about Jewish heritage, and now for learning about Hinduism as well. In the summer of 1993, there were more than eighty Hindu summer camps in America. Some were sponsored by particular Hindu temples, such as the week-long camp of the Sri Venkateswara Temple in Pittsburgh that took place at Slippery Rock State College. The Hanuman Temple in Hempstead, Long Island hosted a Vedic Heritage camp. There were weekend camps such as the one sponsored by the Vishwa Hindu Parishad in a state-park outside Houston or the family camp of the Chinmaya Mission at Endicott College outside Boston. There were both youth and family camps at Arsha Vidya Gurukulam in rural Pennsylvania, a retreat center located in a former Jewish camp in the Poconos and now a year-round facility for Hindu learning. 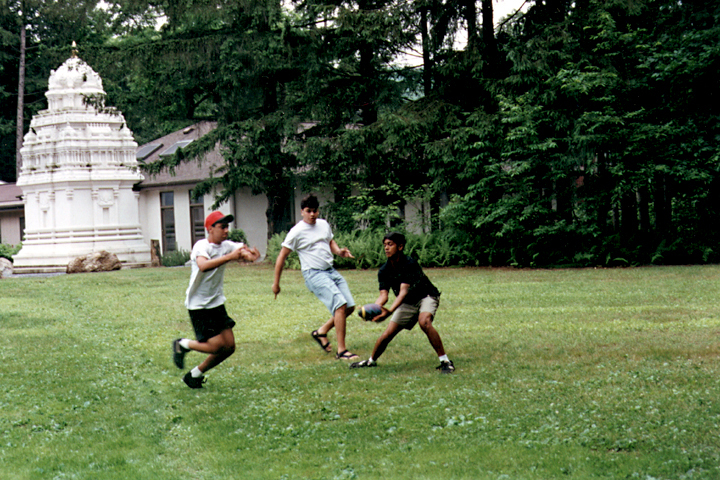 And for college students, there were camps such as the one sponsored by the Hindu Students Council at Camp America in Ohio. Campers of all ages learn some of the mantras and Sanskrit verses that are central to the ritual traditions. They learn to perform the pujas and ask the questions they have about what they mean. “We had three discussions with Swamiji about pujas,” said one camper, speaking of Swami Dayananda. “The pujas really aren’t meaningless. They have meaning. It’s just that we had no idea what it is.” Yoga instruction may be offered at camp, and it is here that many of the young Hindus practice yoga for the first time. And, of course, they learn and sing bhajans. At a Vedic Heritage summer camp at the large Hanuman Temple on Long Island, campers learned the “Hanuman Chalisa,” or the “Forty Verses in Praise of Hanuman,” the most beloved hymn of the temple tradition. Beyond all the activities, the sports, the lectures, and the plays, the camp experience gives young Hindus a sense of bonding and community. Some have renewed these relationships year after year. Eventually, they “graduate” from camp and return, perhaps during college, to be camp counselors.